Welcome to the first issue of The Blue Wave, a weekly newsletter during session from the Arizona State Senate Democratic Caucus where you'll find news about what's happening at your state legislature and how you can make your voice heard! We are urging the governor to develop contingency plans to assist the thousands of Arizonans who are being affected by the Federal government shut down, particularly in our tribal areas. The governor released his executive budget proposal on Friday, which is where we learn what he wants to prioritize this session and how he intends to pay for it. K-12: We are happy to see funding for the School Facilities Board shored up and returning new school construction to a three-year model. We applaud another Democratic idea, funding the Teachers Academy to improve recruitment. We must work together to deliver a tangible second step toward solving the teacher retention crisis and moving their salaries to the national average, to reduce class sizes, holistically address capital needs and provide a sustainable long-term funding solution. The Rainy Day Fund: With a $1.1 billion available, it is responsible to put a significant portion away in the Rainy Day Fund up to the statutory cap of 7 percent of the general fund (an additional $260 million). But to increase it to $1 billion while the state still has underpaid teachers, large class sizes, crumbling schools, roads in need of repair and other critical rural and tribal&nbsnbsp;infrastructure needs that will go unmet makes no sense. Another responsible use of one time funds would be to address the escalating crisis of homelessness in our state. Charter school reform: Hiring more Charter Board staff is good but will do nothing to stop the corruption, self-dealing and conflicts of interest that have outraged the public unless we also pass true accountability reform. We hope the Governor is ready to work on real reforms, which he didn’t directly address in his State of the State speech. School safety and reducing gun violence: The governor made no policy suggestions to keep weapons of mass murder out of dangerous hands. His proposal puts the majority of "school safety" funds toward school resource officers rather than counselors and social workers. The funds should be combined so that schools may apply for the best-suited solution for their students. A good use of one time funds would be developing a community schools pilot program. After months of negotiations by Senator Lisa Otondo and her fellow Lower Basin Drought Contingency Plan Steering Committee members, we finally have proposed language in hand that would adopt a new plan pending approval of all stakeholders. It's critical that everyone comes together to reach a solution that is best for Arizona, otherwise the federal government will do it for us in a way that may not be in our best interest. Read more about it here. On Wednesday the Education Committee unanimously passed a bill to eliminate the mandatory four hour block for English Language Learners. Please contact Senate President Fann's office to ensure this critically important change moves forward with wide bipartisan support. Read more about it here. These bills would prohibit early ballot holders from submitting their ballots any other way except by mail. Those who miss the mail-in deadline could only cast a provisional ballot at their designated polling place. They also change identification requirements at early voting centers and sets the amount of time allowed to correct any issues with an early ballot. We will work to protect every citizen’s access to the ballot and fight these further attempts at voter suppression. This would increase the existing .6 cent Prop 301 education sales tax to a full cent and bans use of those funds for reducing class size or intervention programs, but stipulates they can be used to fund other things like putting more police officers on campuses. It also repeals a tax credit for Arizonans who earn less than $12,500 per year, or families earning $25,000 or less, which would be a cumulative $27 million tax increase for them. Sales taxes tend to be a less stable source of revenue due to economic swings and they force low-income Arizonans to pay a higher percentage of their income than the rich. Appropriations Committee - Passed unanimously after an amendment from Sen. Otondo failed, which would have applied the fee on a sliding scale based on a vehicle's value. This would repeal the new $32 highway safety fee that is assessed on vehicle license tax to fund the Department of Public Safety. While we aren't happy this fee has nearly doubled from the $18 we were promised it would be, we can't let DPS be funded by dollars meant for roads or other critical services. A more common sense approach would be to tie the amount of the Highway Safety Fee to the amount of the vehicle. "Where Democrats have had some of their most significant legislative victories have been in situations where their votes were needed, usually by a Republican governor." "Senate Minority Leader David Bradley made it clear he does not intend for lawmakers to be stampeded into adopting something just to meet the January 31 deadline." "Democratic Sen. Sean Bowie has revived his 2018 bill that seeks to bar mental-health professionals from attempting to change a minor's sexual orientation or gender identity, a practice known as "conversion therapy." A key difference this year? The proposal has Republican support." Senate Democratic Leader David Bradley appeared on Arizona Horizon along with House Democratic Leader Charlene Fernandez to discuss their takes on the governor's state of the state speech and the session ahead. Watch the episode here. 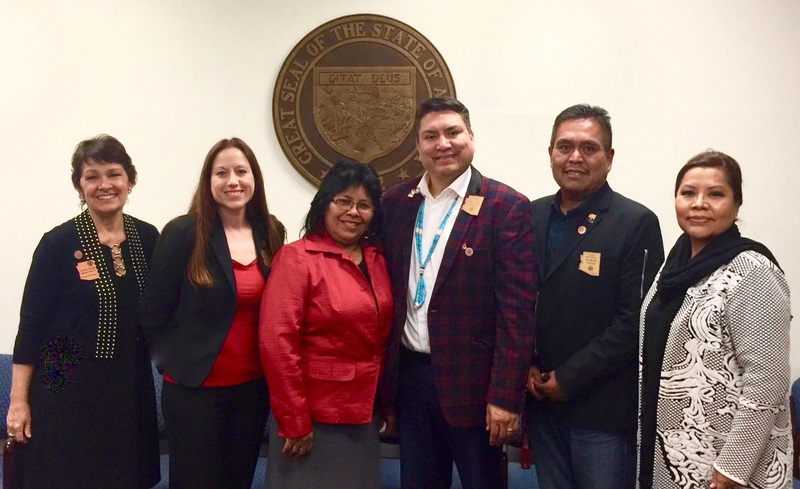 The Senate hosted Indian Nations and Tribes Legislative Day this week. Leaders and members of Arizona's 22 tribal nations were welcomed by our Indigenous senators: Sen. Peshlakai, Sen. Gonzales and Sen. Steele. 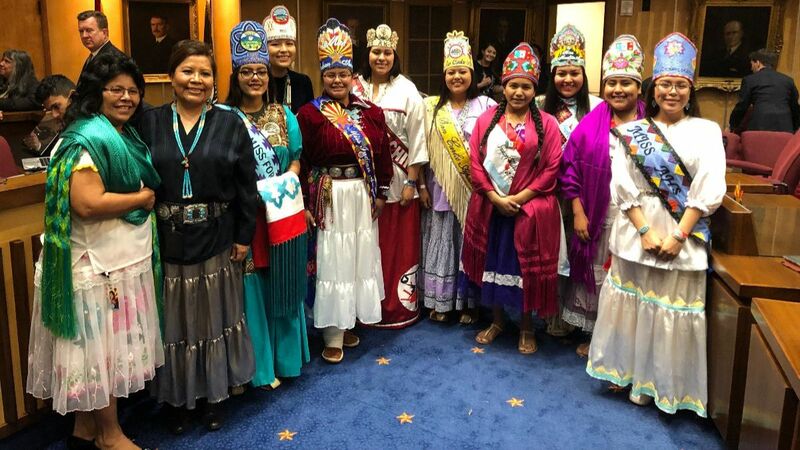 Senator Sally Ann Gonzales of the Pascua Yaqui Nation was elected chair of the Indigenous People's Caucus and Representative Arlando S. Teller of the Navajo Nation as vice-chair.